Khandro Tuktik (Tib. མཁའ་འགྲོའི་ཐུགས་ཐིག, Wyl. mkha' 'gro'i thugs thig) ‘The Dakini Heart Essence’, aka ‘Treasury of Accomplishments: The Practice of the Profound Path of the Dakini [Yeshe Tsogyal]’ is a terma of Dudjom Rinpoche, revealed as a gongter in 1928. It is the main dakini practice of the Dudjom Tersar lineage, and one of the four main terma cycles of Dudjom Rinpoche. The root text of the Khandro Tuktik, “The Profound Path of the Dakini’s Heart Essence”, arose as the mind treasure of Dudjom Rinpoche. It is the practice of the dakini Yeshe Tsogyal in her outer, inner, secret, and innermost secret forms. Related to this cycle, Dudjom Rinpoche provided a commentary on the four stages of practice: kyerim, tsa-lung, thablam, and the dzogchen practices of trekchö and tögal. For those practitioners operating from conceptual mind, kyerim practice offers a skilful path leading from the realm of dualistic concepts into non-dual wisdom mind. While our ordinary dualistic concepts build karma, using these same concepts through creation stage practice allows us to build wisdom habit, which culminates in indestructible wisdom body, inexpressible wisdom speech, and un-deluded wisdom mind. This then becomes the foundation for the other three stages of practice. Through practicing with this kind of wisdom phenomena, we can attain the state of fully enlightened Buddhahood in this very lifetime. Even if we do not attain that state in this lifetime, then we can be certain to recognize the true nature of the deity in the bardo after death. Ordinary sentient beings have no concept of wisdom deity phenomena and easily become frightened and confused in the bardo. This creation stage practice eliminates that fear and confusion. In addition, during this lifetime, it helps to clear all obstacles allowing us to receive the ordinary and extraordinary siddhis, enabling us to gain the accomplishment of great wisdom power. I was twenty-five. It was the tenth day of the waning half of the tenth month in the Earth Dragon year . Trulshik Pawo Dorje, urged by the Dakinis, arrived unexpectedly and said, “You have to write a very concise and precise dakini sadhana right now”. I had been thinking to write just such a sadhana and had considered taking some time as usual to compose it, but when he said this, the complete sadhana and its meaning arose instantly and clearly in my mind. Without moving from my cushion ro changing the words as they came, I wrote them down. Although it could be regarded as a mind terma, I never called it that. I handed it to him on the spot. Then, Trulshik Pawo Dorje requested the empowerment. Since there was no torma available at that moment, Dudjom Rinpoche used a pot filled with beer. For the vase empowerment, he touched the pot to Trulshik Pawo Rinpoche and gave him a drop or two of beer; for the secret empowerment, Trulshik Pawo Rinpoche drank the beer; for the wisdom-knowledge empowerment, he had visions; and for the fourth empowerment, his mind filled with bliss! After this, he travelled to Yarlung Sheldrak to practice this treasure of Yeshe Tsogyal. In his retreat, he received many blessings and returned to recount this to Dudjom Rinpoche. Trulshik Pawo Dorje repeatedly asked me to set down in writing the outer, inner, and secret instruction sections of the practice that would round out the cycle. I couldn’t bear the constant disturbance to my ear, so I added many branch practices related to the original. Over the years, in Kongpo, Lhasa and Kalimpong, Dudjom Rinpoche wrote more Khandro Tuktik texts such as the concise sadhanas of Kurukulle, Senge Dongma, and Nakmo Tröma, and an extensive text on the phases of creation and completion meditation in connection to the four empowerments. Several individuals, unknown to us today, requested Dudjom Rinpoche to write many supplementary texts which expand on the Root Verses. Tsewang Rigzin Nampar Gyalwayday, a Lhasa official, became the Chödak of the Khandro Tuktik, that is to say, he was responsible for spreading the treasure and he sponsored many texts. The Khandro Tuktik is a dakini practice focused on Yeshe Tsogyal. 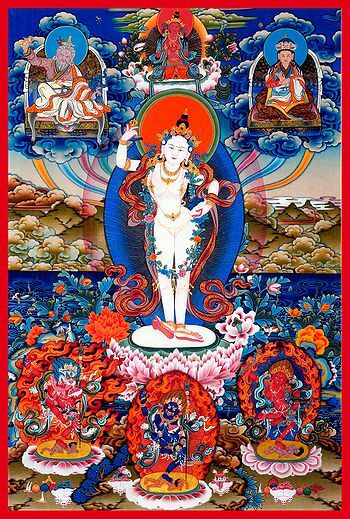 The outer form of the dakini is Yeshe Tsogyal, the inner form is Kurukulle, the secret form is Senge Dongma and the innermost form is Tröma Nakmo. According to Lama Dechen Wangmo : "Concerned only with the mandalas of the enlightened feminine, these instructions and trainings span the three internal tantra-yogas of mahayoga, anuyoga, and atiyoga". Today, the Khandro Tuktik is published in Tibetan as volume 16 of The Collected Works of Dudjom Rinpoche. Two texts are authored by Chatral Rinpoche and the entire treasure consists of 550 pages. ↑ The three other cycles are the Tsokye Tuktik, the Pudri Rekpung cycle, the and the Dorje Drolö cycle. ↑ Lama Tharchin Rinpoche, Teachings on the Khandro Tuktik Commentary (Kyerim part) by Dudjom Rinpoche. ↑ Khenpo Tsewang Dongyal ‘Light of Fearless Indestructible Wisdom’, The life and Legacy of Dudjom Rinpoche, Snow Lion, 2008. Page 181-182. ↑ Jnanasukha.org has translated into English the complete cycle of the Khandro Tuktik. Jnanasukha Founded by Lama Dechen Yeshe Wangmo, and dedicated to the practice of the Khandro Tuktik. This page was last edited on 25 June 2018, at 20:52.